We Worry About COBRA… So You Don’t Have To. With COBRAcare we understand that no matter what your business is, being cost effective and using your time wisely is important to everyone. That is why we pride ourselves on being the most cost effective solution for your COBRA needs. Choose us and you’ll see just how much time, money and unnecessary worrying you will save. 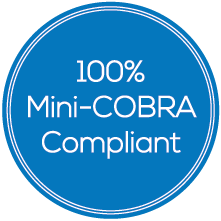 Our COBRAcare Online Web Platform is a complete well supported/updated program that constantly keeps up with COBRA law, regulations and court cases that result in changes to administrative requirements. Our administrative system keeps your data secure and accessible 24 hours a day. COBRA stands for the Consolidated Omnibus Budget Reconciliation Act of 1985. Under COBRA, workers and their families must be offered continued health coverage when their regular health plans are discontinued due to such events as voluntary or involuntary termination or reduction of work hours, change in Medicare eligibility, employee death or divorce (otherwise known as qualifying events). It is the responsibility of the employer to notify employees of their rights under COBRA or face financial and/or legal fines. Who is entitled to COBRA Benefits? An employee covered by a group health plan on the day before a qualifying event who is either an employee, the employee’s spouse, or an employee’s dependent child. In some cases a retiree, their spouse and dependent children can also be qualified beneficiary’s. In addition, any child born to or placed for adoption with a covered employee during the period of COBRA coverage is considered a qualified beneficiary. Does my company need to offer COBRA? COBRA is applicable to any company that employs 20 or more individuals on more than 50% of its typical business days in the preceding year and offers group health plans. These health plans include: medical, dental vision, prescription drug, and medical reimbursement flexible spending plans. How much can a company be fined for COBRA non-compliance? Companies can be audited by the Internal Revenue Service where the burden of compliance is placed upon the employer. COBRA regulations are enforced through a joint effort by the IRS, US Department of Labor and Department of Health and Human Services. Violations resulting from non-compliance include non-deductible excise tax penalties of $100 per individual affected per day. Statutory fines of up to $110 per day can also be imposed under ERISA (Employee Retirement Income Security Act). Civil lawsuits and attorney’s fees on top of all of this can really add up to substantial penalties for a company. Can I log in to my existing account? Contact a COBRAcare Expert Today. I am interested in learning more about COBRAcare with StreamlineHR.